« K4 Tap Takeover at Sconni’s Alehouse! October is Breast Cancer Awareness month, so every Friday in October we want you to drink for a good cause. 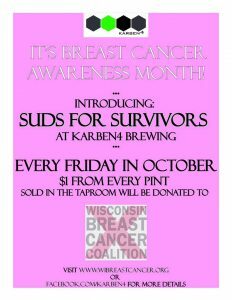 We’ll be donating $1 of every pint sold, from open to close, to the Wisconsin Breast Cancer Coalition. So kick off your October weekends with us!